Winter simply refuses to surrender this year in northern and central Wisconsin. Snow depths range from just a couple inches in central Wisconsin to some areas with still more than 20 inches in the far north. And it doesn't appear that it is letting up: there is a winter storm warning this weekend with predictions of another 8 to 10 inches in some areas. 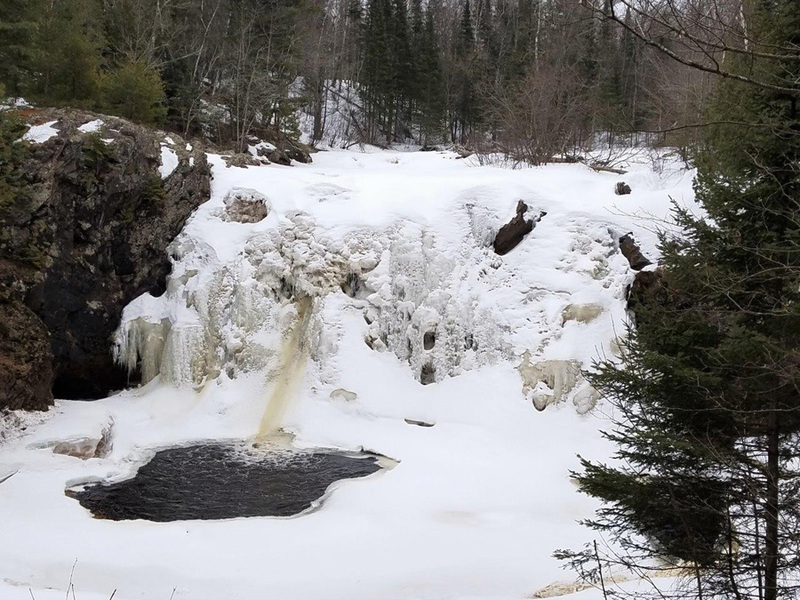 The Brule River State Forest and Pattison State Park have continued to maintain ski trails but grooming has ended at all other properties. And a reminder, even if areas do get substantial snow this weekend, snowmobile trails are now closed in all counties. Many trails run on private property through easements that have ended for the season. Some northern lakes also still have substantial ice cover with 20 inches or more of ice. Lakes are opening up through central Wisconsin and most lakes in the south are open. Walleye runs are on on both the Wolf and Fox rivers and there has been some great walleye action on the Wolf for the past 10 days. There have still been hundreds of shore anglers and boaters out to catch a trophy walleye on the Fox with one group catching upward of 60 walleye this week. The Oconto River downstream of Stiles Dam is open and the walleye run is currently underway there as well. 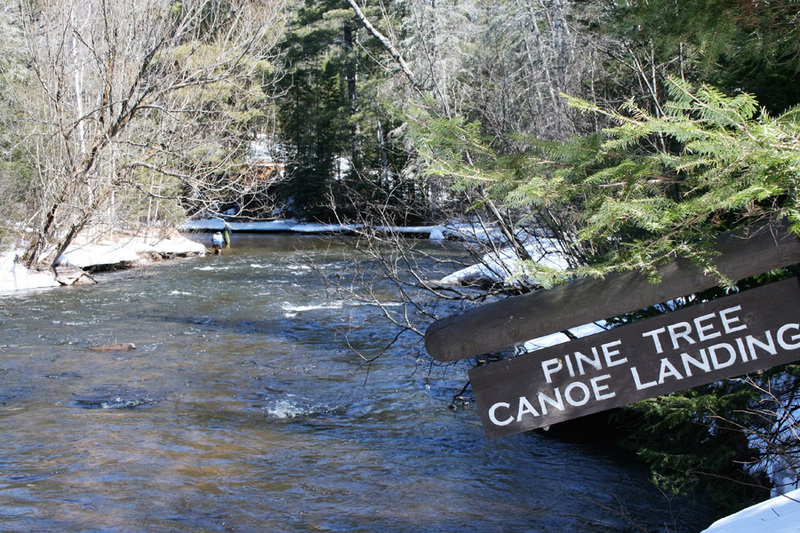 The number of anglers is slowly beginning to increase along the Menominee and Peshtigo rivers. However, the number of fish being caught is still low. The ice fishing season is definitely over on the west shore of Green Bay, with ice breaking up and the ice mass shifting and open water visible over the weekend. All Door County boat landings on the Bay side are still locked with ice. There are pockets of open water in some near shore areas but the harbors are still frozen solid. The Sturgeon Bay canal has been producing some northern pike and brown trout for anglers trolling and shore fishing. Boat landings on the Lake Michigan side are all open and a few anglers have been out in search of browns, with a good bite in Baileys Harbor. Steelhead fishing has been picking up with anglers having success fishing spawn sack in local creeks. On Lake Michigan tributaries anglers were targeting steelhead on the Sheboygan River with reasonable success. Sauk Creek remains low and few steelhead have been reported. There are 15 fishing clinics [PDF] set for April 14 in southeastern Wisconsin. Kids 15 and under can learn how to fish with clinics run hourly from 9 a.m. to 3 p.m. in Milwaukee, Racine, Washington and Waukesha counties at park ponds stocked with fish. Turkeys are gobbling, displaying and toms can be seen roaming around all hours of the day in perfect timing for the youth turkey hunt this weekend April 15 and 16, and the start of the spring turkey season on April 18. Hunters still looking for a leftover turkey permit, can check availability on the DNR website searching keyword "turkey." The hunt this weekend could be a struggle with the cold weather but the upside of our current weather pattern is no reports of ticks out. Loons and other waterbirds continue to stack up south of Wausau and Green Bay where water bodies are ice free. Raptor migration has been excellent the past few days with many red-tailed hawks, turkey vultures, sharp-shinned hawks, and bald eagles moving north, a few golden eagles, red-shouldered hawks, and ospreys among them. Migration was limited most of the week, although Wednesday night brought a wave of new migrants to far southern Wisconsin. Shorebirds made a splash with increasing numbers of greater and lesser yellowlegs, a few pectoral, Baird's, and least sandpipers, a dunlin, and the first spotted sandpipers. Savannah, vesper, chipping, and white-throated sparrows are also becoming more common. Dark-eyed juncos remain numerous in the south and central while the north eagerly awaits their passage to come soon. Other arrivals in the south, albeit in small numbers so far, include purple martin, barn swallow, and northern rough-winged swallow, yellow-bellied sapsucker, rusty blackbird, black-crowned night-heron, brown-headed cowbird, and both pine and palm warbler. Hummingbirds are no farther north than extreme southern Missouri, Illinois, and Kentucky - look for their arrival here in the last week of April across southern counties and the second week of May up north. Loons and other waterbirds continue to stack up south of Wausau and Green Bay where water bodies are ice free. Large numbers of common goldeneyes, red-breasted mergansers, and bufflehead were reported along some portions of Lake Michigan. Raptor migration has been excellent the past few days with many red-tailed hawks, turkey vultures, sharp-shinned hawks, and bald eagles moving north, a few golden eagles, red-shouldered hawks, and ospreys among them. Snowy owls, rough-legged hawks, northern shrikes, and common redpolls remain in good numbers beyond their typical migration schedules. Meanwhile, mourning doves and red crossbills have fledged young already, hooded mergansers and wood ducks have begun egg laying, turkeys are gobbling and displaying statewide, and pine siskins were observed carrying nest material this week. April 13, 9 a.m.-noon, Ridgeway Pine Relict Workday - Ridgeway features towering cliffs of pine with northern plant species underneath and extensive oak savanna. Help the Friends of Ridgeway Pine Relict, Inc. care for this site by removing invasive plants and planting native plants. Workdays are once a month on the second Friday. We will work on spraying garlic mustard or cutting and piling brush. No experience is necessary, you will be trained on site. One day, 15 great locations, and a lifetime of memories! Kids 15 and under can learn how to fish at 15 free fishing clinics in southeastern Wisconsin on Saturday, April 14. The clinics run hourly from 9 a.m. to 3 p.m. in Milwaukee, Racine, Washington and Waukesha counties at park ponds stocked with fish. Get the details [PDF]! Sheboygan County - A few boats were spotted at the Deland Park ramp, but only two anglers who were using flicker shad reported success catching browns. The fish ranged in weight from 1.5-11 pounds and were caught in 8-20 feet of water. Despite moderate pressure, trout action has been tough at the Sheboygan piers, but a few determined anglers fishing off of the south pier have had success catching browns. Spoons and minnows were used to catch fish that averaged 4.5 pounds. Pigeon River fishing has been reported as very slow and anglers targeting steelhead had little luck. Water temperature hovered in the mid to high 30s, but the water level remains low. Although Weedens Creek remains mostly iced over, an angler reported that he had landed two decently sized male steelhead on spawn. The water temp was 29 degrees with limited visibility. Anglers targeting steelhead on the Sheboygan River near the Kohler dam are reasonably successful despite the cold weather conditions. Streamers, nymphs, and spawn sacs have all successfully enticed a bite, although one angler fishing off of County A reported landing a 14 pound brown that fell for his bead rig. Water clarity is good and temps range from 34-36 degrees. Ozaukee County - Pressure at the Port Washington ramp was light, with only a few boats spotted fishing this week. Several small brown trout and one coho were caught by anglers using flicker shad in 10-20 feet of water. Fishing pressure on the Port Washington piers was very light. Two fishermen casting spoons off of the North pier stated that they had no luck landing any fish, but one of them had a bite. Along the Port Washington shoreline only one angler fishing for brown trout was seen near Rotary Park. He had little luck catching any trout, however he did accidentally snag a hefty 31-pound carp by its tail, which was immediately released after being weighed. Several brown trout and the occasional steelhead have been taken by the Port Washington Utility, however action remains very hit or miss. Successful anglers report night crawlers as the bait of choice. Sauk Creek fishing has been reported as slow with just a few steelhead being caught along with some suckers. Spinners, spawn, and nymphs were used to entice a bite, yet wooly buggers seemed to work the best. The water level remains very low, water clarity is good, and water temperature ranged from 36-37 degree. Good air quality for Wisconsin on Saturday, April 20, 2019 at 7:50 pm CT.